Bates College is committed to educating the whole person by supporting the integration of intellectual and personal growth across the entire experience. In this way, a Bates education aims to engage students deeply to gain skills, confidence and curiosity. The Bates model of the liberal arts offers a high-quality education compelling its learners to strive for justice in an environment of shared humanity and live an examined life with courage and tenacity. Learning Assessment at Bates focuses on supporting and invigorating the academic and programmatic learning opportunities and outcomes for students with these goals at the forefront. This process involves dynamic and collaborative reflection, research, implementation and analysis with faculty, students, staff and administration. 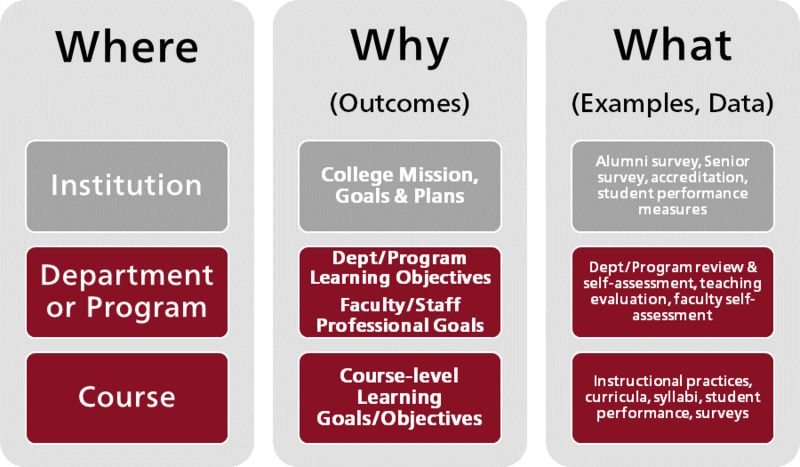 One aspect of Student Learning Assessment at Bates occurs at the department or program level. Examples of work involving this level of assessment include regular academic department/program reviews, self-study at the department/program and individual faculty level, grant-funded initiatives, development of learning objectives, and more. Another aspect of Student Learning Assessment at Bates occurs at the course level. Examples of work involving this level of assessment include faculty self-study and/or peer feedback on instruction, resources and support for enhancing diversity and inclusive teaching practices, developing curricula, examining student outcomes and more.